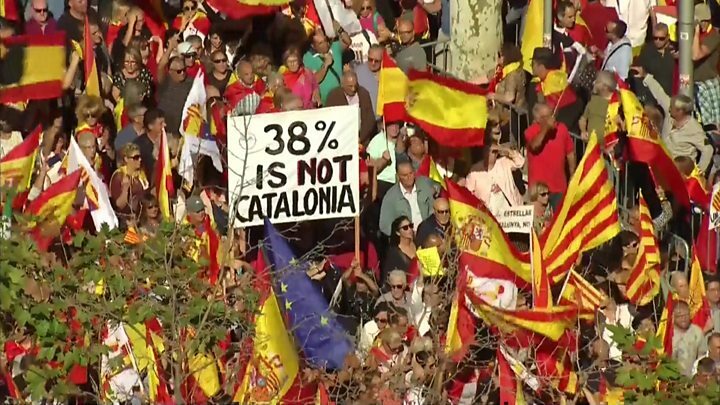 A major rally calling for Spanish unity is starting in Barcelona a day after Catalonia was stripped of its autonomy for declaring independence. Many of those protesting in the region’s largest city brought signs calling for sacked Catalan leader Carles Puigdemont to be jailed. Mr Puigdemont was dismissed as Spain’s central government took control of Catalan institutions. On Sunday, a minister in Belgium said he could get political asylum there. Spain has been gripped by a constitutional crisis since a referendum, organised by Mr Puigdemont’s separatist government, was held earlier this month in defiance of a ruling by the Constitutional Court which had declared it illegal. 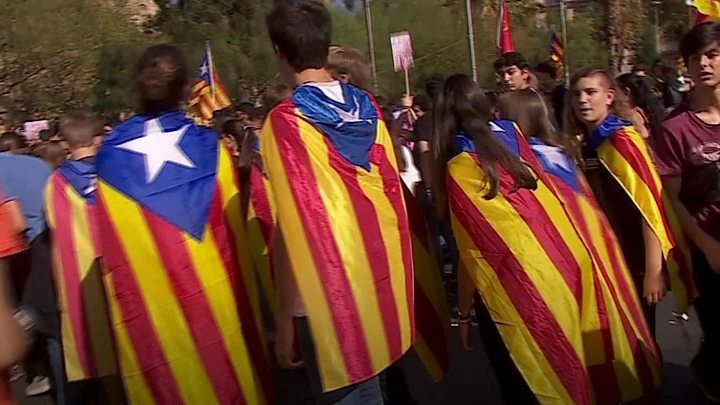 Marina Fernandez, a 19-year-old student attending the demonstration, said she was unhappy with the actions taken by the Catalan authorities. “I am enraged about what they are doing to the country that my grandparents built,” she told the AFP news agency. Catalonia crisis: What next for Spain? Friday saw the regional parliament declare independence, with Madrid responding by declaring the move illegal. Prime Minister Mariano Rajoy then announced the dissolution of the regional parliament and the removal of Mr Puigdemont as Catalan leader, and ordered that fresh regional elections should be held in December. Mr Puigdemont has urged “democratic opposition” to direct rule from Madrid, which has said it would welcome his participation in the election. A government spokesman in Madrid, Íñigo Méndez de Vigo, said Mr Puigdemont had the right to continue in politics, despite his removal from office. “If Puigdemont takes part in these elections, he can exercise this democratic opposition,” he said, quoted by Reuters. On Sunday, Belgium’s migration minister Theo Francken told local TV the separatist leader could be given asylum protection which Spain would find difficult to reverse. “If you see the situation at the moment, the prison sentences and the repression from Madrid and the prison sentences that are bandied about. Then the question is obviously whether somebody like that has the chance of a fair trial,” he said. There is no suggestion that Mr Puigdemont is seeking to leave Catalonia. Later on Sunday, he is expected to attend a football match in Girona, the heartland of the pro-independence movement, when the local team play Real Madrid – who Mr Rajoy supports. What powers has Catalonia now lost? A poll published by Spanish national newspaper El Pais on Saturday suggested more Catalans (52% to 43%) were in favour of the dissolution of the regional parliament and the holding of elections. Fifty-five per cent of Catalan respondents opposed the declaration of independence, with 41% in favour. Before Madrid took over the Catalan government, the region had one of the greatest levels of self-government in Spain. It has its own parliament, police force and public broadcaster, as well as a government and president, though those have now been dismissed. Catalans had a range of powers in many policy areas from culture and environment to communications, transportation, commerce and public safety. Foreign affairs, the armed forces and fiscal policy were always the sole responsibility of the Spanish government.